Potatoes (Solanum tuberosum) are the leading vegetable crop in the world and an important food source. They are even loved by children who refuse to eat their vegetables. Potatoes are a rich carbohydrate source, they are sodium and cholesterol free, and have surprising health benefits. Potatoes are much better food than simple carbohydrates like sugar or biscuits. Potatoes make you feel full for longer and because of that you will eat less. Potatoes are going to help you with: weight management, digestion, scurvy, bone health, cancer prevention, stress, high blood pressure, nervous system health, heart diseases, kidney stones and diarrhea. Potatoes are biologically alive after harvest and they stay alive for a long time. Some potato varieties are able to sprout 2 years after harvest. Commercial potatoes are usually coated with sprout inhibitors, but if they are not coated and kept on cool and dry place, they are going to sprout. Potatoes may look similar, but different varieties of potatoes have different sugary profile, texture, starch levels, taste and use. Two main categories are starchy and waxy potatoes. Starchy potatoes are high in starch and low in moisture, and they are good for baking and mashing. Waxy potatoes have low starch content and they hold shape well after cooking. Solanine, a glycoalkaloid poison, can occur naturally in green potatoes and new sprouts, especially if potatoes are not stored properly. This poison can cause dry and scratchy mouth, nausea, vomiting, headaches and neurological problems. Therefore, choose potatoes that are not green and throw away the sprouts. If you are looking to gain weight, humble potatoes might be the right choice for you. What makes them a good choice is the fact that they are primarily made of carbohydrates, and because higher consumption of carbohydrates leads to weight gain, they are the most obvious and an inexpensive choice for gaining weight. One of the best health benefits that potatoes can offer is the fact that they can be easily digested. Cooked potatoes are rich in easily digestible starches, those starches are preventing constipation and protecting your body from serious conditions like colorectal cancer. It is best to eat them while they are still warm. Potato is a natural antipyretic, it contains anti-inflammatory properties and substances that reduce fever. We have to mention that there is a debate on should you use potatoes to reduce fever, because fever is helping your body to fight off infections. Take one grated potato and fill up the socks. This is used to reduce fever in children, so use socks that belongs to adult, bigger ones. Then put the socks on the child’s feet. Now leave it for an hour or so. 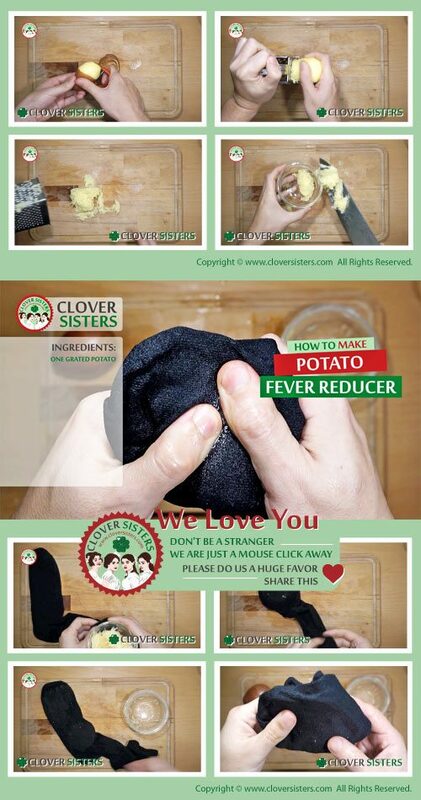 Potato will get dry and brown and fever will be reduced.